The Marine Waters Sustainable Aquaculture Strategy (Strategy) provides clear direction on the development of marine aquaculture in NSW. The Strategy was developed in 2018 as a whole of government initiative under the guidance of the State Aquaculture Steering Committee, comprising 11 government departments and divisions with various levels of responsibility from project assessment and regulation, to navigation and maritime safety, to wildlife management. Some 87% of seafood purchased in NSW is imported. In order to meet growing seafood demand, offset imports, and to meet the future food security needs of the state, the NSW Government recognises the need to promote opportunities for aquaculture development. 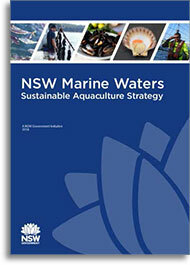 The Strategy provides a regulatory and industry best practice framework for the expansion of the NSW marine aquaculture industry in an ecologically sustainable and socially responsible manner. Implementation of the Strategy will avoid ad hoc aquaculture industry development in NSW waters which may be at unsuitable locations or using technologies and approaches that are not optimal. The Strategy covers coastal waters to the jurisdictional limit of three nautical miles offshore (state waters), but does not include estuaries. The Strategy compliments the successful NSW Land Based Sustainable Aquaculture Strategy and the NSW Oyster Industry Sustainable Aquaculture Strategy. For further information email: aquaculture.management@dpi.nsw.gov.au, or call an Aquaculture Management Officer on (02) 4982 1232.